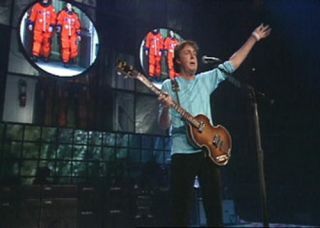 Sir Paul McCartney roused ISS Expedition 12 commander Bill McArthur and flight engineer Valery Tokarev early Nov. 13, 2005 EST during live concert broadcast to the International Space Station. During his tour, the former Beatle also paid tribute to NASA's STS-114 shuttle astronaut crew. NASA will beam The Beatles' song,"Across the Universe," into deep space Monday in an unprecedented long distance dedication by the U.S. agency. NASA's Deep SpaceNetwork will transmit the song at 7:00 p.m. EST (0000 Feb. 5 GMT) on Feb. 4 in honor of several cosmic-themed anniversaries. Monday marks the 40th anniversary of the day the song wasrecorded. This year also marks the 50th anniversary of NASA's founding and theinception of The Beatles. Two other milestones also are being honored including,the 50th anniversary of Explorer 1, the first U.S. satellite, and the 45th birthdayof the Deep Space Network, an international network of antennas that supportsmissions to explore the universe. Thetransmission is aimed at the North Star, Polaris, 431 light-years away fromEarth, travelling at a speed of 186,000 miles per second (300,000 kps). "Acrossthe Universe," though credited to "Lennon/McCartney," wasprincipally written by Beatle JohnLennon, and the lyrics speak of "limitless undying love which/shinesaround me like a million suns." "Amazing! Welldone, NASA!" said former BeatleSir Paul McCartney in a message to the space agency. "Send my love to the aliens." Lennon'swidow, Yoko Ono, commented: "I see that this is the beginning of the newage in which we will communicate with billions of planets across the universe." NASA hasused Beatles music before, notably in November 2005, when McCartney performedthe song "Good Day Sunshine" during aconcert transmitted to the International Space Station. "Here Comesthe Sun," "Ticket to Ride" and "A Hard Day's Night" havealso been played in wake-up calls to astronaut crews in orbit. The publicaround the world has been invited to participate in the event by playing thesong at the same time it is transmitted by NASA. Many of thesenior NASA scientists and engineers involved consider themselves among thegroup's biggest fans.